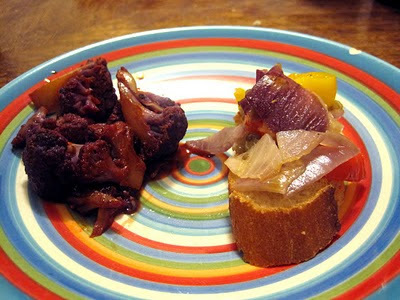 Part two of my tapas dinner includes the two vegetarian dishes I made, both of which were super delicious. The cauliflower with smoked paprika just might be my new favorite way to prepare cauliflower! The flavor is absolutely amazing, and the dish couldn't be easier to pull together. It's lots of fun to use purple cauliflower like I did here, but the white variety will taste just as good. The roasted veggies are also great. I was a little worried about the method - I tend to think of roasting and peeling bell peppers as a lot of work - but it actually wasn't nearly as bad as I'd worried! Yes, this step is a bit of a pain, but it really doesn't take too much time (especially when the other dishes you're making are super simple), and the results are excellent. I loved the combination of red onion, bell pepper, and eggplant here, but I think this recipe would also be fantastic if you added some roasted zucchini or tomato. Really, anything that tastes good roasted would be a yummy addition. Piled high on slices of baguette, these veggies really hit the spot! Heat olive oil in 12-inch heavy-bottomed stainless steel skillet over medium-high heat until shimmering. Add sliced garlic and cook, stirring constantly, until garlic is light golden brown. Using slotted spoon or skimmer, remove garlic to small bowl and set aside. Add cauliflower to skillet and cook, stirring occasionally until fully tender and caramelized in spots. Remove from heat, add 1/2 teaspoon paprika, reserved garlic, and sherry vinegar (oil may spatter when adding vinegar—be careful). Stir to combine, season to taste with salt and pepper, transfer to wide serving dish, and sprinkle with remaining paprika. Set oven rack to lower middle position and preheat oven to 400 degrees. Rub eggplant, onion halves, and bell peppers with 2 tablespoons olive oil and season generously with salt and pepper. Place on foil-lined rimmed baking sheet and roast for 30 to 40 minutes until eggplant and peppers are fully softened and charred on the exterior, and onions are softened with a few charred spots, turning vegetables every ten minutes to achieve even cooking. Some vegetables may cook faster than others - remove them to large mixing bowl as they finish roasting. Allow vegetables to rest until cool enough to handle, then peel eggplant and pepper (skins should slip off fairly easily with fingers). Roughly chop all vegetables into strips and return to mixing bowl. Add sherry vinegar and remaining olive oil and stir to combine. Season to taste with salt and pepper. Serve warm or at room temperature with fresh bread. Serious Eats did a feature a few weeks ago on tapas dishes that are easy to make and involve only a few ingredients. I loved the idea, and got right to making three of the dishes for a fantastic dinner. One word of warning - the yield on some of these is funny if you're making them as a dinner rather than as appetizers, as you'd expect. All say they'll serve 4-6 as an appetizer, but even with doubling all three recipes, it wasn't quite enough for six for dinner. (Luckily I had some of Dorie's magical Florida Pie in the freezer for dessert, so that filled everyone up!) Other than that, though, all the recipes were super flavorful and delicious. I made chickpea-chorizo stew (pictured below), as well as Escalivada Catalana (Catalan-style roasted veggies served with bread) and cauliflower with smoked paprika, both of which I'll post later this week. 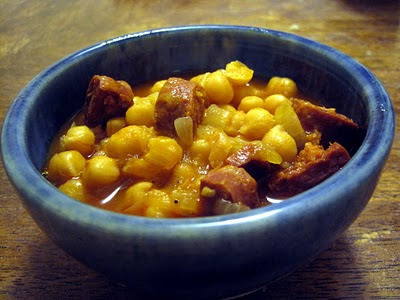 The chorizo-chickpea stew was fantastic, and it was amazing how much flavor you could get out of so few ingredients! The recipe recommends cured chorizo, a sort I don't think I'd ever used before. I usually buy the chorizo they have at the meat counter, which I believe is smoked but still needs to be refrigerated. The cured sort is more like a hard salami that doesn't need to be refrigerated. It introduced a great new flavor that I hadn't had before, and also added luscious richness to the stew. Yum! The best part about this dish (as well as the other tapas dishes I tried) is that they're fairly easy to pull together, so you really can make three or four of them in an evening without going crazy! The variety makes for a nice dinner, since I usually don't make this many separate dishes. Serves 4-6 as an appetizer, or double the recipe to serve 4-5 for dinner as part of a multi-dish meal. Heat olive oil in 10-inch heavy-bottomed stainless steel skillet over medium heat until shimmering. Add chorizo and cook, stirring frequently until some fat renders and the sausage is starting to brown, about 10 minutes. Add the onion and cook, stirring frequently, until onion is fully softened but not browning, 5-8 minutes. Add the tomato paste and cook, stirring constantly, until paste begins to fry, about 2 minutes. Add chickpeas, stir to combine, bring to a simmer, reduce heat to low, and reduce until stew-like consistency is reached, about 10 minutes. Season to taste with salt and pepper. 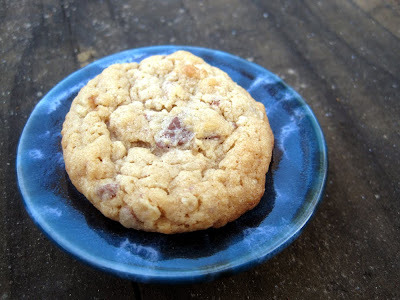 These might be my new favorite peanut butter cookie! A toffee-chocolate bar is chopped up and added to the dough, adding a fantastic layer of flavor and crunch. Rolled oats are also an excellent addition to add more of a chewy texture. I used smooth peanut butter because that's what I prefer for sandwiches and have around the house, but you could use crunchy-style or add some chopped peanuts for even more crunch. 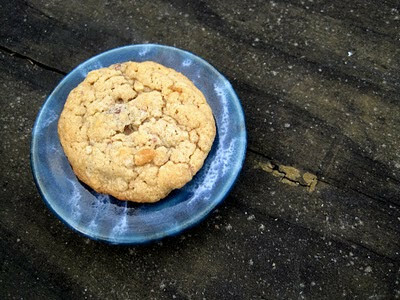 Either way, these cookies are highly addictive, and you'll find yourself popping one in your mouth every time you walk by! 1. Preheat the oven to 375F. Line a baking sheet with foil or parchment paper. 2. In a medium bowl, whisk together the flour, oatmeal, baking soda and salt. 3. In a large bowl, cream together the butter and sugars until light and fluffy. Beat in the egg and vanilla until smooth, followed by the peanut butter. With the mixer on low speed or working by hand, gradually blend in the flour mixture, then stir in the toffee bits. Drop scant 1-inch balls onto baking sheet. 4. Bake for 9-11 minutes, until edges are golden. Cool on baking sheet for 3-4 minutes, then transfer to a wire rack to cool completely. I made this salad a couple of weeks ago to go with a fantastic butternut squash risotto - more on that later. The salad was entirely delicious, sort of a cross between fruit salad and green salad. There are enough berries that the salad definitely screams "fruit" and not regular salad with a few bits of fruit mixed in. 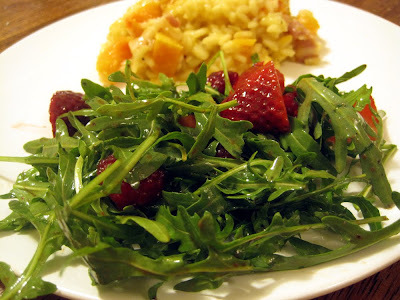 But the dressing and spicy arugula pull it toward savory and make it a perfect accompaniment to a rich main dish like risotto. Because the greens are fairly sturdy, this salad keeps fairly well to the next day if you have leftovers. 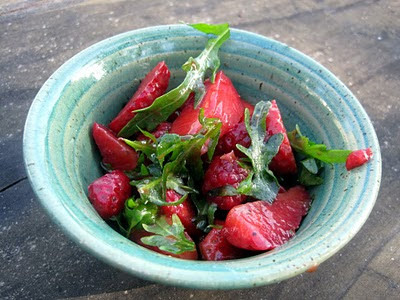 Combine the strawberries, raspberries, and arugula in a large bowl. In a jar with a tightly fitting lid, combine a generous pour of fig balsamic vinegar, a spoonful of Dijon mustard, a few tablespoons of extra virgin olive oil, and salt and pepper. Screw on the lid and shake vigorously until combined. Taste and add more vinegar or olive oil as needed. Toss with berries and greens. This is a fantastic chicken dish that comes together fairly easily on a weeknight. Since it's wine-based, it reminds me a bit of coq-au-vin, except much lighter because it features white wine instead of red. However, that homey, comfort-food style is still there, making this a perfect warm dinner on a cool night. You could definitely play around with the veggies here, although shallots, carrots, and potatoes were very tasty. Other root veggies would add a nice touch as well. Definitely don't play it safe with the lemon juice - the acidity really brings out the other flavors in the dish and makes this chicken sing! Note: We found 4 thighs was enough for 4 people since there are lots of veggies here. If you're serving a hungrier crowd, feel free to double the amount of chicken and marinade, leaving the amount of veggies alone. 1. Rinse and pat dry chicken thighs and add them to a bowl with the garlic, serrano peppers, oregano, cumin and lemon juice. Stir and let sit for 30 minutes. Heat the olive oil over medium-high heat and then add chicken and marinating liquid. Sprinkle with salt and pepper. Brown chicken on all sides and then remove from pot and set aside. 2. Heat butter in the same pan and saute shallots and carrots for a few minutes. Season with salt and pepper. Add the chicken back into the pot. Pour the white wine over top and cover. Cook over med-low heat until chicken is cooked through, about 30 minutes. 3. 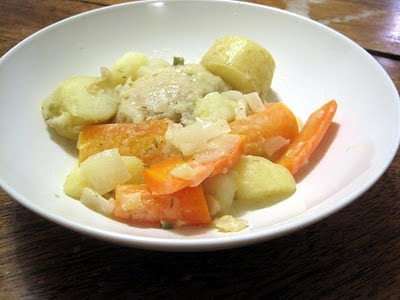 Meanwhile, cook potatoes separately in salted boiling water until just tender. Drain and add to the chicken pot. When the chicken is cooked through, remove from the the heat and add the heavy cream and lemon juice, stirring gently so everything gets coated. Serve with lemon wedges, salt, and pepper.